Independent Directions to this Site: From Highway 416 take exit 66 (Fallowfield Road). If southbound, a 0.4 km offramp dumps onto Fallowfield, where you will turn right or west. If northbound, the 0.4 km offramp brings you to Fallowfield, where you will turn left or west onto it and in 0.5 km join the southbound offramp traffic. Both groups will now follow Fallowfield Road west 16.5 km to reach Munster Road. Turn left or southeast onto Munster Road and drive 10.0 km to Kettles Road. Marlborough Forest Loop Route Directions: From the junction of Munster Road and Soldier's Line, go southeast on Munster Road 1.7 km to Kettles Road. Map of the Munster and Kettles Roads Area Click on other site numbers to go to their pages. Site Description and Birding Information: The marsh on the northeast side of Munster Road 0.2 km north of its junction with Kettles Road is home to American and Least Bittern, Virginia Rail, Sora, Alder Flycatcher and Marsh Wren. The conifers around this marsh should be checked for species fond of the food they provide. This is an excellent owling spot too. 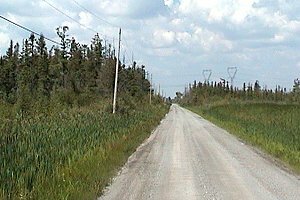 Northeast of the junction, along Kettles Road after dark, listen for Whip-poor-will and watch for them on the gravel road. Marlborough Forest Loop Route Directions: From the junction of Munster and Kettles Roads, go northeast on Kettles Road 1.0 km to the pulloff on the right or southeast for the next site on this loop, the Ruffed Grouse Area on Kettles Road area.